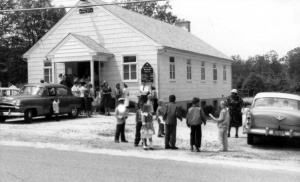 Centereach Mennonite Church in 1954. 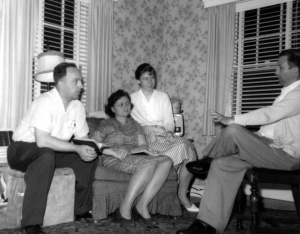 Pastor Curtis Godshall (right) provides membership instruction for Emil and Mildred Schoch in 1960. Landis, Glenda Godshall. "Centereach Mennonite Church (Centereach, New York, USA)." Global Anabaptist Mennonite Encyclopedia Online. January 2013. Web. 26 Apr 2019. http://gameo.org/index.php?title=Centereach_Mennonite_Church_(Centereach,_New_York,_USA)&oldid=139906. Landis, Glenda Godshall. (January 2013). Centereach Mennonite Church (Centereach, New York, USA). Global Anabaptist Mennonite Encyclopedia Online. Retrieved 26 April 2019, from http://gameo.org/index.php?title=Centereach_Mennonite_Church_(Centereach,_New_York,_USA)&oldid=139906.